The Philippines Insurance Commission (IC) has published a set of rules covering insurance Web aggregators in a move to supervise and monitor the sector. For her commitment to helping advisers flourish in their careers and find fulfilment in their mission of helping clients achieve financial security, and championing of the agency force by enabling, ennobling and engaging them, Ms Rizalina Mantaring, CEO and Country Head, Sun Life Financial Philippines, was named the executive champion of the year at the 3rd Asia Trusted Life Agents & Advisers Awards. 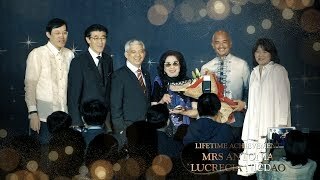 For her 43 years of service in the insurance industry, for changing the lives of many women through the profession and for her continued commitment and achievements as an octogenarian, Mrs Antonia Lucrecia Nicdao from Philam Life, Philippines, was recognised with the Lifetime Achievement Award at the 3rd Asia Trusted Life Agents & Advisers Awards. The Philippine microinsurance sector is estimated to expand to 16.3 million households (73.3 million Filipinos) by 2020, according to a study on mutual and cooperative microinsurance in the country published by the International Cooperative and Mutual Insurance Federation (ICMIF) and Microinsurance MBA Association of the Philippines, Inc (also known as RIMANSI). Eleven winners were honoured at the 3rd Asia Trusted Life Agents & Advisers Awards presentation ceremony dinner held in Manila last evening with the Philippines' insurance commissioner Dennis B Funa as guest of honour. The Insurance Commission (IC) of the Philippines warned insurers, pre-need companies, health maintenance organisations (HMOs), mutual benefit associations, brokerages and agencies, as well as the public about the risks of engaging in digital currency transactions, particularly when used as an investment vehicle. The final round of judging for the 3rd Asia Trusted Life Agents & Advisers Awards took place in Singapore yesterday morning. Judges gathered to deliberate and decide by secret ballot which of the finalists would emerge as winners.